And not of the rich man variety. Many of you are aware that I've been working on a redesign of Grand Central Station for a while. Part of that was to create a better looking building, with an improved layout for travellers to find their way around. This also had an extra goal, which I'm ready to unveil today! - Entities can ride through, including players in minecarts. - They don't interact with portals at all; they're independent. - They don't pair up with one another; positions can be shifted as needed. - Only ops can create and manage them. The new Grand Central Station has gates setup for Laurasia's four main Nether lines, so you can start your journey straight from the overworld while still benefitting from the Nether's faster travel speed! The new starting points are located on the upper floor of the station, next to the matching overworld line. The rails are now also facing the wall of the main destination; that is, the Southern Expressway is on the South wall, the Transoceanic (heading East) is on the East wall, and so on. Some of the main rail endpoints will be updated in the coming days and weeks to use gates instead of stopping in the Nether. Port Townshend, as illustrated in the video clip above, was already taken care of. A new visual signature, seen below, will also be included at several key locations to indicate the proximity of the main Nether and overworld lines. 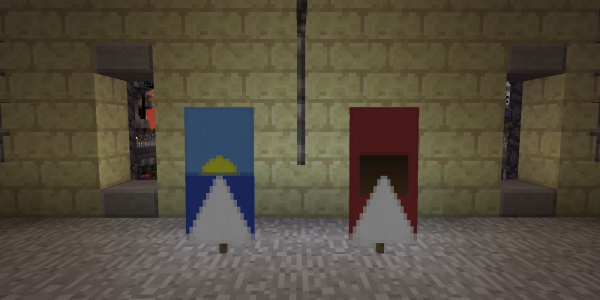 If you currently have a private line that ends at a Nether portal, and you'd rather have a gate so that your rail goes straight to your overworld base, please contact an op and we'll do the change for you. Nether Central Station will remain available as a back-up option as well as to include the post office and the network map. I hope you enjoy this new addition! On a side note, I updated the servers earlier today, and the annoying bug where you couldn't right-click on iron doors and some trapdoors has been fixed through a plugin update!